Am I Responsible for a Person Injured While Trespassing on My Property? Home » The Law & You » Am I Responsible for Someone Injured While Trespassing on My Property? Am I Responsible for Someone Injured While Trespassing on My Property? Dave Kuharchik: We’ve got a situation involving hunting and trespassing for today’s edition of “The Law & You.” And back with us are attorneys Greg Fellerman and Ed Ciarimboli. Guys, you ready to roll with the question? Dave: All right let’s get to it. This one is from Bill in Tunkhannock. He says, “I own some property used for hunting. I have ‘no trespassing’ signs all around the border. If someone trespasses and gets hurt, am I liable?” What happens in this case? Ed: Well, generally speaking, Bill, you will not be liable. And the reason being is you have properly posted your land. Now, that becomes an issue in it of itself, whether you properly posted all over your property. Now, if you know about somebody who is continuing to trespass, and you don’t do anything about it and you have something on your property that is dangerous, that is an entirely different issue even if your property is properly posted. Greg Fellerman: What the lesson is it’s very important to make sure you properly post your property and patrol your property because if people are coming on your property and you know about it, you can be held liable for it. Dave: All right, so we had a situation, it looks like we have resolved. If you need legal advice or help, gentlemen, how can viewers get in touch with you? 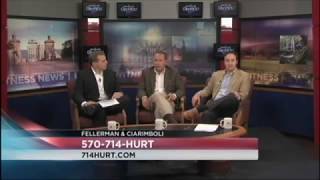 Greg: By phone at 570-714-HURT or on the web at 714hurt.com. Ed: And go to our Facebook page. Like us on our Facebook page if you have a question for “The Law & You,” put it on our page and we’ll do our best to answer it on an upcoming segment. Dave: All right, these guys have won awards for their legal work. And of course, we always appreciate having them here on the show. Attorneys Greg Fellerman and Ed Ciarimboli, thanks so much and we’ll see you again next time. Ed: Thanks so much, Dave.